A CALM, SWEET FRIEND: 10 years old / 20 lbs. Mostly Mutts adoption center is open Mon-Sat. 11-4pm. Some of us are in foster homes so please call 770-272-6888 1st to find out if I’m available to meet during the week. Hi, I’m Carmela – an even tempered, sweet older girl. I am not your typical high energy Jack Russell Terrier and am super content to just chill on the couch with my people. I may tuck my tail and appear a bit shy at first, but give me the loving attention I am seeking, and I warm up to you brilliantly. As my foster mom says, “I just want love”. I have had the chance to meet other dogs in the neighborhood of my foster home, as well as my foster sibling and – though I don’t initiate play with them, we do get along fine. So, if you have a calm and well-mannered dog at home, let’s meet to see if we are a friend match. My potty manners have been good in my foster home (as well as at the shelter), so hopefully that will be the case in my furever home, too. I don’t love my crate (as I would rather be with my people), but I will sleep in there through the night with no issues. During the day, I like to hang out where ever my people are and will follow you around the house … just to keep tabs on you. LOL Because I am a calm and quiet little lady, I think I would enjoy a calm and quieter type home. Older children who don’t expect a playmate may be a good fit for me, as I am not playful, but I am certainly loving. I haven’t met kids yet, so let’s meet! You may notice that I have a fatty tumor on my chest. The vet has checked it out, and no treatment is needed. It is just something that can often develop as we age! 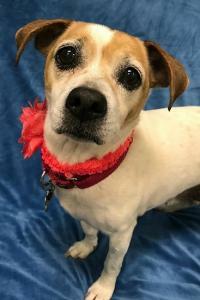 If you are looking for a sweet girl who demands nothing more than your love and affection, I could be just the one for you! Energy level: 3-4 I'm current on vaccinations, micro-chipped, spayed, and my adoption fee is $299.00 which also includes an engraved name tag, Martingale collar and leash.